Magic DOES HAPPEN When You REALLY Want It To. 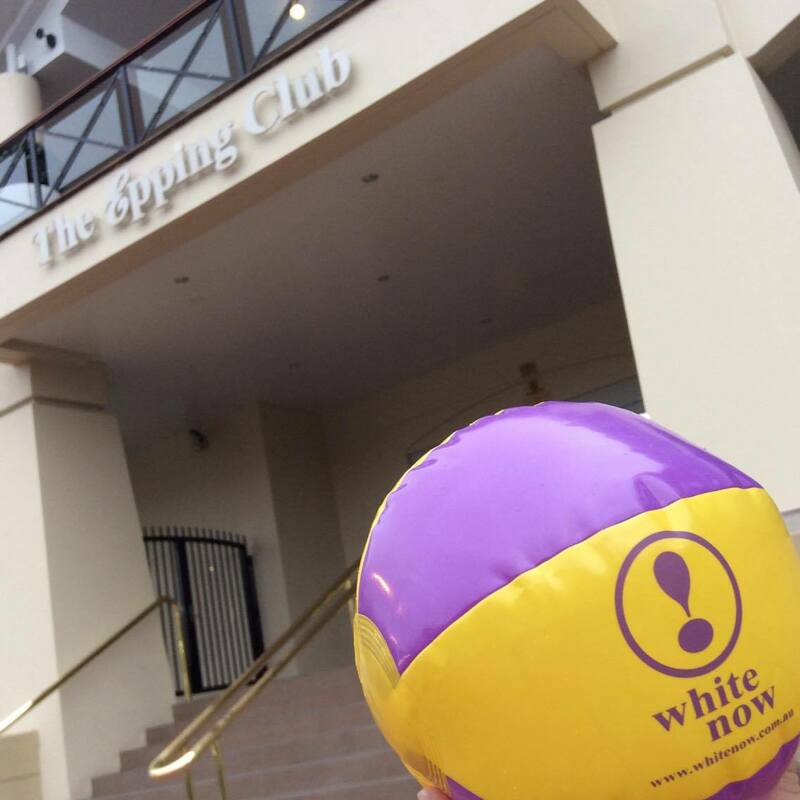 | Bloggin' White Now !………. Magic DOES HAPPEN When You REALLY Want It To. Yes, MAGIC DOES HAPPEN ! Pictured here are the only two people in the world that I know as ‘Magic’. 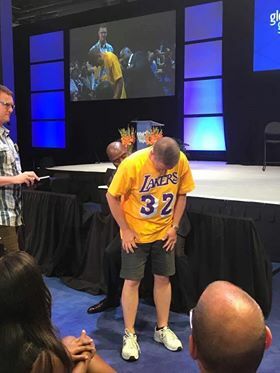 The one in the suit is Magic Johnson, the retired pro-basketballer for the Lakers, and the one in the Lakers Shirt is Steve ‘Magic’ Anson the Club Manager (COO for The Epping Club). The irony of this pic is that it really should be Magic Johnson in the Lakers shirt and Steve Anson in the suit ! So what’s this blog about? Some of you may know that I worked at The Epping Club for a few years in the early 1990’s (along with two other clubs prior to that). My immediate Supervisor at the time was Steve Anson, and just to prove the loyalty of the team at The Epping Club, Steve has been employed there since 1991 (26 years as of 2017) and as a side note, the next boss up was Peter Saez (the now CEO) who has been at the club since 1989 (28 years). Talk about loyalty ! Steve lived, breathed and bled basketball 🏀🏀. I knew that his blood was honestly purple and yellow, which suited me fine as they too are my favourite colours💜💛. His number one hero was Magic Johnson from the LA Lakers. Since 1992 I have not ever called Steve, “Steve”. I started calling him ‘Magic’ a few months into working together and I have respectfully called him by that name ever since (never have I called him Steve). Late last year, I even sent one of our purple and yellow company Wiz Balls to (Steve) ‘Magic’ as I thought that it would make him smile as it was a ball and it was in Lakers colours. I told him that he was to use his office bin as the basket and shoot goals all day. I knew that he actually would do this. So this is a story about passion, dedication and dreams coming true. Steve’s dedication to his role and his club saw him heading across to this year’s G2E (Global Gaming Expo) in Las Vegas. 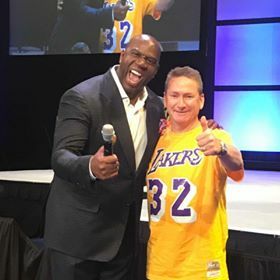 Steve was so excited to hear that the Friday’s Keynote speaker was the one and only Magic Johnson. Steve was smart enough to bring along a Lakers shirt, but who would’ve thought he would go against all tradition and actually WEAR it to the session. Well, lucky he did ! Magic pulled Steve out of the audience and brought him out the front for about 5 minutes. Steve said that he was incredibly nervous and shaking, but ridiculously excited at the same time. Little did Magic Johnson know that he was Steve’s life long idol nor did he know that Steve actually has a small tattoo on his ankle of Magic. Steve was too shy to show Magic but Steve’s friends in the audience made sure that Magic knew. 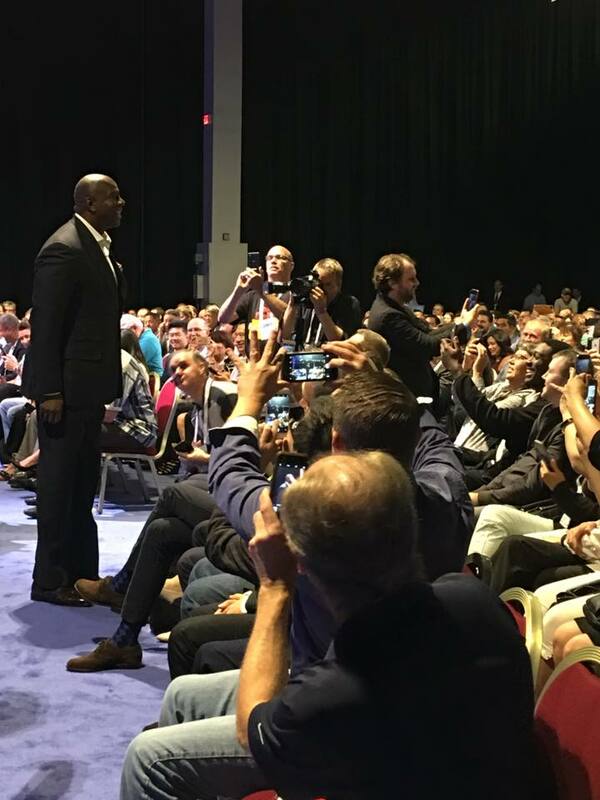 Steve was able to ask Magic some basketball questions and have a decent chat. Then, Magic signed his shirt. A shirt that will surely never be washed again. Sign away Magic ! Steve will never wash that shirt again. I was told about this amazing meeting a couple of days after the event. I am sure that all of you come across people, friends, colleagues and acquaintances that have idols that they are so passionate about. I know a fair few people like this. Those with SSTID / Rabbitohs logos tattooed to their chests alongside images of Greg Inglis. I even know someone who was such a fan of the Disney character, Jessica Rabbit that he had her tattooed on his arm knowing full well that he would never meet this fictional idol. Steve ‘Magic’ Anson is one of these truly passionate people. As soon as I heard that Steve got to meet Magic, I had tears running down my cheeks. All I could think was “Steve is so deserving of this – I am so happy for him“. It was almost like I knew that after Steve had a family, that this was his other one desire and WOW, his dream ACTUALLY came true. Sometimes you just have to keep on doing what your doing, and ‘stuff just happens’. I am sure that if Steve had tried to somehow meet Magic over the last 20 years, that it would not have been possible. I am also sure that Steve would not have guessed that by just being in the room with Magic would lead to being next to him chatting away. 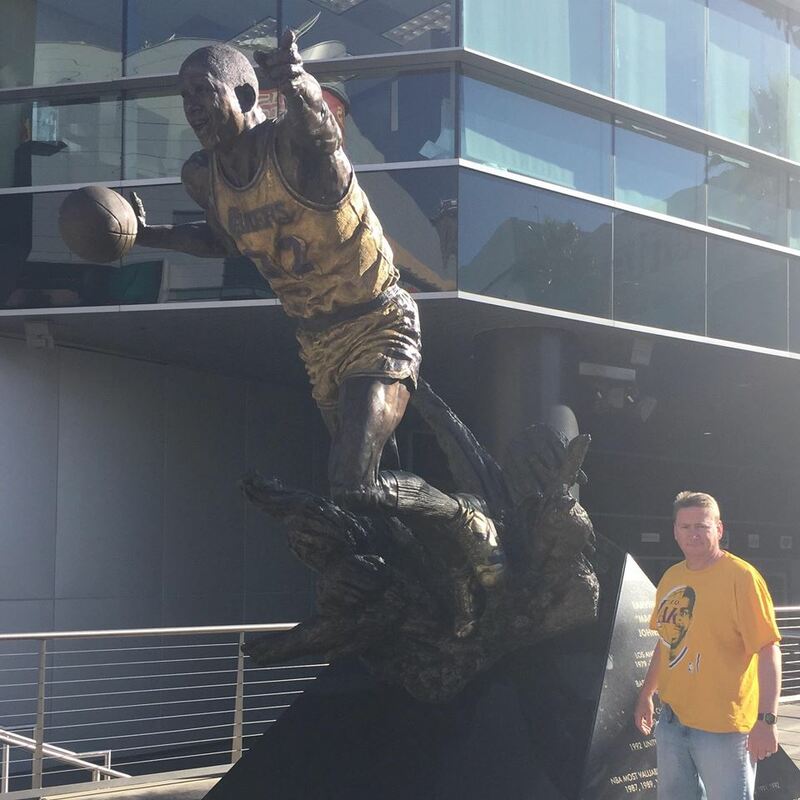 Steve’s decision to wear his Lakers shirt that day was the smartest move he could make. Well done Steve, I am so glad that this has happened and I really do have some insight into how important this meeting has been to you. A champion bloke meets a champion basketballer. 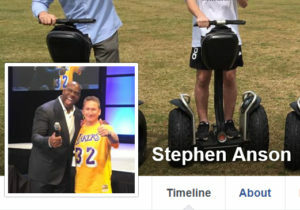 It would not come as a surprise to anyone who is reading this that Steve’s Facebook Profile Pic is now Magic and him in Las Vegas. The funny thing is that this new pic replaced his previous pic which was Steve with a bronze statue of Magic Johnson. Life just became more real for Steve ‘Magic’ Anson ! Steve’s NEW Facebook profile pic ! Steve’s previous Facebook profile pic prior to meeting him and being his new BFF ! Previous PostThe Big Panther Has Gone But Will Never Be Forgotten – VALE: Roger CowanNext PostSeriously, Who Needs New Members Anyway ! Sharing our passion, views & experience.